The Victorian signal box at Llandrindod Wells station, on the scenic Heart of Wales Line, is a relic of an age when levers, cables and bells guaranteed safe movement of trains. I t was built by the London & North Western Railway at Crewe, possibly in the 1870s, and assembled beside the level crossing north of the station. The upper-storey windows gave the signalman a good view of the crossing and in both directions along the railway tracks, including the sidings where goods were loaded or unloaded. The box was moved to the railway station in 1990 for preservation. 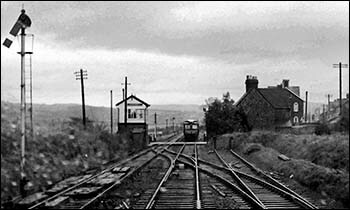 Newer technology and simplification of the tracks had made the signal box redundant. The 1960s photo, courtesy of the RCTS Archive, shows the box in its original position and some of its semaphore signals. The box contains a lever frame, with long levers pivoted in the lower storey. The signalman on the upper floor pulled or pushed the levers to alter points (switching trains from one track to another) or raise and lower the arms of semaphore signals. Points were linked to the box by rods running alongside the tracks, and signals by cables and pulley wheels. A complex interlocking mechanism made it almost impossible for an inattentive signalman to cause a train to derail on points which were wrongly set or to collide with another train. The signalman in each box would communicate by electric bell code with his neighbours, for example to accept an approaching train into his domain and to request a train’s exit from their domain. Signalmen on a largely single-track line like the Heart of Wales also managed the token apparatus which prevented head-on collisions. Train drivers weren’t allowed to enter the next single-track section (which usually extended for many miles) without possessing the relevant token. If the section was clear, the signalman would remove a token from a metal holder. This action would automatically lock the holder and the corresponding holder in the signal box at the opposite end of the section. This prevented any other tokens for this section being removed. The signalman would hand the token to the train driver, who would surrender the token on reaching the end of the section. There the signalman would place the token in his holder, thereby unlocking both holders, ready for the next train. Notice how many steps the signalman had to descend and climb every time he had to exchange tokens with drivers. Levers which controlled remote signals or points needed brute force. The job needed some stamina!